For a lot of people, not currently having a functioning band around them would be reason enough to put off recording an EP. Not Danny Fury. As the, then, line up of Tango Pirates ceased to become viable as a working band, he pulled the remains into the studio, called in a few favours and got to work. The result is the aptly named In Transition. 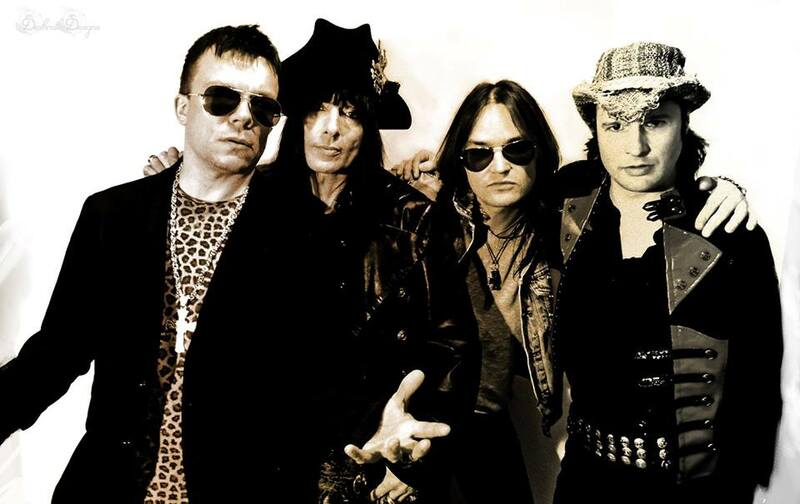 The first thing that strikes you is the records line up, an ensemble cast that is nothing short of a who’s who of sleaze rock past and present, an after dark, underground, super group…if you can imagine such a thing. With Danny fulfilling the front and back roles of vocals and drums and the rhythm section completed by Vera Wild and Dave Tregunna, it is the revolving door of guitarists including Luca Commencini of Spizz Energy, Marc Oliver of Plastic Heroes and Jelly’s Mickey Howard – that show Danny’s credentials, most bands would kill to have just one of these guesting on their record. Opening salvo Coming Home sets the tone that you would expect from the one time Lords of The New Church drummer, brooding, caustic grooves fashioned into gutter anthems and Healthy Junkies Phil Honeyjones edgy, razor wire guitar lines stabbing through the heart of the song. Darkside reminds us that this genre has its roots in brattish street punk as much as it does in rock, if not always musically then certainly in attitude and it’s nonchalant swagger and The Devil To Pay plays with gothic overtones. Too Close perfectly wraps up the e.p. with a bit of a Sham 69 reunion as Dave Parson wades in with some incendiary guitar alongside Tregunna (Fury also played alongside them in one of the recent re-formations) for a great swansong. There is always something great about the way us Brits deliver this style of rock. Across the pond, the bands were brasher, cheesier and more mainstream, to a large degree, where as here it has always been darker, sleazier and more illicit. Just look at the way Americans fight, all puffed up chests and bravado, here it’s a swift kick in the balls when you are least expecting it and a passing quip as your assailant walks over you on the way out. These six songs are the musical equivalent of that. Don’t come to In Transition expecting musical barricades to have been stormed or boundaries to have been pushed, this is the sound of a band who know what they do and are content to do it better than anyone else. Yet this isn’t just a re-invention of the wheel either, for they at least give it a good polish and a fancy lick of paint before heading off on a late night joyride with a crate of beer in the back seat. Obvious references such as The Lords and the tragically overlooked Gunfire Dance pepper these songs and if you have a liking of that fusion of rock, punk, and gothic then you will love In Transition. It was a pleasure to write about. Thanks Dave. it is a great review and will help to spread the word. Reblogged this on alleykat77's Blog.